The main portion of the wall is developed from the numerous papillae covering the corium of the coronary cushion. We have in this way numberless down-growing tubes of horn. Professor Mettam describes their formation in a singularly happy fashion: "Let the human fingers represent the coronary papillae, the tips of the fingers the summits of the papillae, and the folds of skin passing from finger to finger in the metacarpo-phalangeal region the depressions between the papillae. Imagine that all have a continuous covering of a proliferating epithelium. Then we shall have a more or less continuous column of cells growing from the tip of the finger or papilla (a hollow tube of cells gradually moving from off the surface of the finger or papilla like a cast), and similar casts are passing from off all the fingers or papillae." From this description it will be noticed that each down-growing tube of horn bears a striking resemblance to the growth of a hair, described on p. 47. In fact, the horn tube may be regarded as what it really is, a modified hair. We next continue Professor Mettam's illustration, and note how the modified hairs or horn tubes become as it were matted together to form the hoof wall. The cells lining the depressions are also proliferating, and their progeny serve to cement together the hollow casts of the papillae, thus giving the inter-tubular substance. We have thus produced hollow tubes, united together by cells, all arising from the rete Malpighii of the coronary corium. Section of the lower part of the horn tubes shows them to contain a cellular debris. Thus, in all, in the horn of the wall we find a tubular, an intertubular, and intratubular substance. In fact, hairs matted together by intertubular material, and only differing from ordinary hairs in their development in that they arise, not from papillae sunk in the corium, but from papillae projecting from its surface. Although this disposes of the wall proper, there still confronts us the question of the development of the horny laminae. To accurately determine this point it is absolutely essential to examine, histologically, the feet from embryos. In the foot of any young ungulate in the early stages of intra-uterine life horizontal sections will show a covering of epidermis of varying thickness. [A] This may be only two or three cells thick, or may consist of several layers. Lowermost we find the cells of the rete Malpighii. As some criterion of the activity with which these are acting, it may be noted that with the ordinary stains their nuclei take the dye intensely. The cells of this layer rest upon a basement membrane separating the epidermis from the corium. At this stage the corium has a perfectly plane surface. Fig. 26. - Section Of Foot Of Equine Foetus, Seventy-Seven Days Old. The Rete Malpighii Rests On A Plane Corium; The Rent In The Section Is Along The Line Of The Cells Of The Rete (Mettam). Fig. 27. - Section From Foot Of Sheep Embryo. It Shows A Pronounced Epithelial Ingrowth Into The Corium (Mettam). The next stage will demonstrate the first step in the formation of the sensitive laminae. [A] The plain surface of the corium has now become broken up, and what is noticed is that the broken-up appearance is due to the epithelial cells irrupting and advancing en échelon into its connective tissue. Each point of the ingrowing lines of the échelon has usually one cell further advanced into the corium than its neighbours, and may be termed the apical cell. 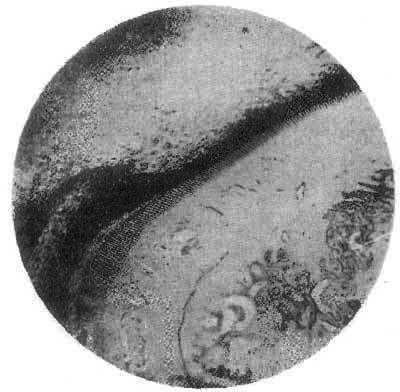 The fine basement membrane separating epithelium from corium is still clearly evident. This epidermal irruption of the corium takes place at definite points right round the foot. It is extremely probable, however, that it commences first at the toe and spreads laterally. As yet, these cellular ingrowths (which are destined to be the horny laminae, and cut up the corium into sensitive laminae) are free from irregularities or secondary laminae. Before these are to be observed other changes in connection with the ingrowths are to be noticed. Fig. 28. - Section From Calf Embryo. 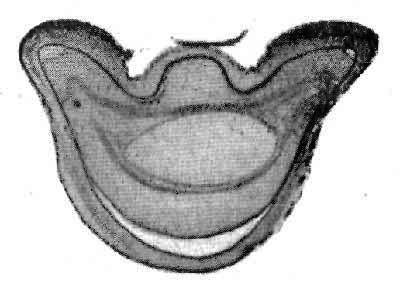 The Epithelial Ingrowths Hang Down From The Epidermis Into The Corium Like The Teeth Of A Comb (Mettam). The first is merely that of elongation of the epithelial processes into the connective tissue, until the rete Malpighii gives one the impression that it has hanging to its underneath surface and into the corium a number of thorn-like processes. These extend all round the front of the foot, and even in great part behind. Accompanying this elongation of the processes is a condensation of the epithelial cells immediately above the rete Malpighii, with a partial or total loss of their nuclei. This is the first appearance of true horn, and its commencement is almost coincident with the first stages of ossification of the os pedis. Fig. 29. - Section Of An Epithelial Ingrowth From An Equine Foetus. It Shows Commencing Secondary Laminar Ridges. In The Centre Are Epithelial Cells Which Are Undergoing Change Into Horny Elements To Form The Horn Core, Or 'Horny Laminae' (Mettam). With the appearance of horn comes difficulty of sectioning. The last specimen that Professor Mettam was able to satisfactorily cut upon the microtome was from a foetus between three and four months old. 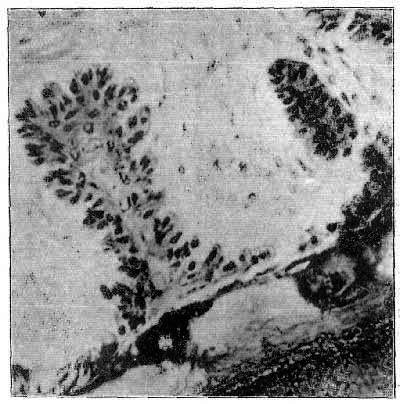 In this the secondary laminar ridges were clearly indicated, and the active layer of the rete Malpighii could be traced without a break from one ingrowing epithelial process to the next, and around this, following all the irregularities of its outline, and covering the branches of the nascent laminae. 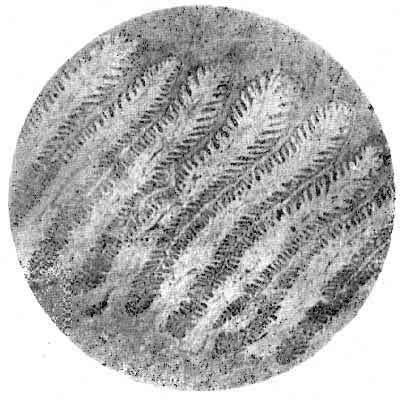 The laminae mostly show this branching as if a number of different growing points had arisen, each to take on a function similar to the epithelial process as it at first appeared. In the centre of the processes a few nuclei may be observed, but they are scarce, and stain only faintly; they have arisen from the cells of the rete Malpighii which have grown into the corium. In fact, the active cells are passing their daughters into the middle of the process, and these pass through similar stages as those derived from the ensheathing epidermis. In other words, the daughter cells of the constituents of the rete Malpighii which have grown into the corium pass through a degeneration precisely similar to that undergone by cells shed at desquamation, or those which eventually give rise by their agglutination to a hair. This is the real origin of the horny laminae, and the thickness of these is increased merely by an increase in the area covered by the cells of the rete Malpighii - i.e., by the development of secondary laminar ridges. If a section from a foal at term be examined, the processes will be found far advanced into the corium, and, occupying the axis of each process, will be seen a horny plate, continuous with the horn of the wall. No line of demarcation can be observed between the horn so formed and the intertubular material of the wall. They merge into and blend with each other, with no indication of their different origins. The cells that have invaded the corium have thus not lost their horn-forming function. 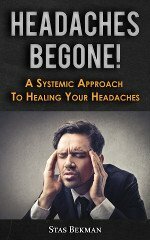 There has merely been an increase in the area for horn-producing cells. The horny processes are continuous with the hoof proper at the point where the epithelial ingrowth first commenced to invade the corium, and fuses here with the horn derived from the cells of the rete Malpighii which have not grown inwards, and which are found between the processes in the intact foot. From this it is clear that some considerable portion of the horn of the wall is derived from the cells of the rete Malpighii covering the corium of the foot. It becomes even more clear when we remember the prompt appearance of horn in cases where a portion, or the whole, of the wall has been removed by operation or by accident (see reported cases in Chapter VII (Diseases Arising From Faulty Conformation. A. Sand-Crack).). Fig. 30. - Section Through Hoof And Soft Tissues Of A Foal At Term. 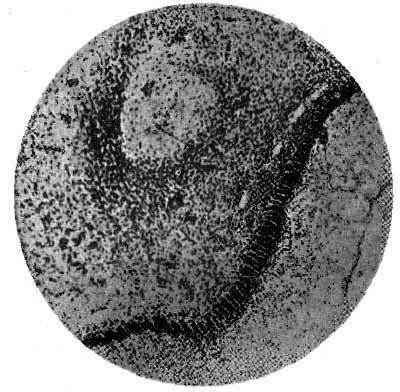 The Horn Of The Wall Is Shown, And The Horn-Core ('Horny Laminae') Of The Epithelial Ingrowth. The Latter Has Advanced Far Into The Corium, And Is Now Provided With Abundant Secondary Laminar Ridges (Mettam). From the matter here given us it is easy to understand how, in a macerated foot, the appearance is given of interlocking of the sensitive and horny laminae. We see that the horny laminae are ingrowths of the rete Malpighii, ploughing into and excavating the corium into the shape of leaves - the sensitive laminae. Putrefactive changes simply break into two separate portions what originally was one whole, by destroying the cells along its weakest part. This part is the line of soft protoplasmic cells of the rete Malpighii. Thus the more resistant parts (the horn on the one hand, and the corium covering the foot on the other) are easily torn asunder. As a result of the evidence we have quoted, we are able to answer our original question in the affirmative. Seeing that the horny and the sensitive laminae are both portions of the same thing - namely, a modified skin, in which the epidermis is represented by the horny laminae, and the corium by the sensitive - it is clear to see that the cells covering the inspreading horny laminae are dependent for their growth and reproduction upon the cells with which they are in immediate contact - namely, those of the sensitive laminae - and that therefore the sensitive laminae are responsible for the growth of the horny.